Compute in planes, trains, and automobiles-and thousand other places-when you have a portable personal computer. If the user can't come to the:computer the computer must come to the user. Such is the credo of the laptop computer community, a varied collection of workaholics, regular travelers, computer hobbyists, and students. While Adam Osborne and the 28-pound Osborne I portable are generally acknowledged to be the founders of the faith, things have changed radically since the introduction of the first transportable computers. Advances in technology have dramatically shrunk the size and weight of portables, while increasing the memory and disk storage capabiltics to rival that of powerful desktop systems. The development of specialized chips with extremely low power requirements and liquid crystal display (LCD) technology have substantially freed the portable from its power umbilical cord. If the thought of a fully functional computer system - in a package about the size and weight of a telephone book - intrigues you, you're a good candidate for a laptop computer. 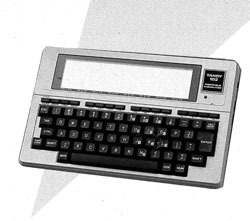 Three years ago, rnost industry experts claimed that the laptop market had been saturated by the Tandy Model 100. The limited success of various portables introduced in 1985 and 1986 seemed to bear those predictions out. In retrospec, the market for laptops wasn't dying, it was approaching critical mass. 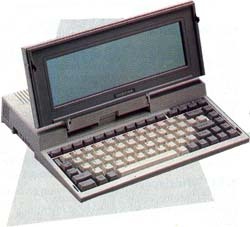 The introduction of the IBM Convertible laptop legitimized the genre in the minds of many computer users and manufacturers. The past year has seen over two dozen new lightweight rnachines for computing on the hoof, and X-ray machine operators at airports now yawn instead of reaching for their guns when the electronic innards of a carry-on computer pop up on their screen. Here's a brief look at six of today's best battery-powered machines. Computers carry extra baggage-jargon that's difficult to understand for the uninitiated. And laptops, a particular subculture of computers, has its own lingo. Here are enough explanations of computer- and laptop-specific terms to at least get you through this article, maybe enough to get you past the laptop salesperson. Backlit. Since LCD screens depend on reflective light, adding a small built-in light makes text and graphics much easier to see in low-light conditions. BPS. Bits per second is the speed at which information is transferred from one computer to another, usually when connected via modem. Divide the bps rate by 10, and you have a rough character per second (cps) transfer rate. At 300 bps, for instance, approximately 30 characters are transmitted every second. K. Stands for Kilobyte, which is 1024 bytes of data. (A single text character, for instance, takes up one byte in a computer file.) It is used in this article to show how much memory (RAM) a particular computer may have. Laptop. Computers which weigh less than 20 pounds, have a flat-screen display, and include internal batteries (whether rechargeable or not) fall into the laptop category. Within this definition are numerous variations, as this article attests. LCD. Liquid Crystal Display, the dominant display in laptops, uses electrically charged crystals to form characters and graphics. Attractive to laptop computer manufacturers because of their low power consumption, LCD screens are also used in such consumer products as digital watches. Microfloppy. The hard-shelled 3½-inch disks which are used in virtually ail disk-equipped laptops. The other standard drive size, commonly used in desktop computers, is the 5¼ inch floppy. Microprocessor. The brain of a computer, this single chip processes the information it receives from programs in RAM and ROM. Modem. A device which converts digital signals from a computer to the analog signals the phone system can understand (and vice versa). Necessary for computer telecommunications. MS-DOS. Microsoft's Disk Operating System (or the variations termed PC-DOS) has been the standard since the IBM PC was introduced. MSDOS provides the interface between the computer's hardware and its software, allowing you to store information on disks and carry out file and disk maintenance tasks. Nicad. Nickel-cadium batteries can take repeated recharging and still deliver power. Their relatively heavy weight is one of the factors against ultra-light laptops. Nonvolatile. Though not permanent, nonvolatile memory retains its information after the main computer power is turned off. Ports. Connectors, usually on the back of a computer, used to link the machine to such devices as printers, disk drives, monitors, and modems. RAM. Random Access Memory is the part of a computer's memory that's used to temporarily store programs and data files. When the power is turned off, information in RAM vanishes. Ramdisk. A part of RAM that's designated as a "disk drive." Since the "drive" is completely electronic, with no moving parts, retrieving programs and data (or storing them) is extremely fast. RGB. Color monitor which mixes red, green, and blue to create a multitude of other colors. It's the standard type of color monitor in the IBM PC and compatible world. ROM. Read-Only Memory, as opposed to RAM, is permanent. Information stored in ROM (usually programs necessary to running the computer system) remains coherent when the power is turned off. Supertwist. A method, used in manufacturing, of improving the legibility of LCD displays. Telecommunications. The process of tranmitting information, via computer, from one location to another using a modem and the phone lines. The Tandy 102 is a rugged, compact machine that gets top marks for its portability. The system weighs only three pounds, is about the size of a magazine, and is an inch-and-a-half thick, making it easy to stow in a backpack or briefcase. The screen is a fixed LCD panel that shows 40 characters on each of its 8 lines. While the display is not a supertwist or a backlit LCD [portable and computer jargon have been italicized for easy reference-see the sidebar "Laptop Lingo"], the large size of the characters and the ability to adjust the screen contrast yields very good legibility. The 56 full-size keys of the keyboard are laid out in standard typewriter format. There are also programmable function keys, an imbedded numeric keypad, and separate cursor movement controls. The keys are adequately spaced and have a good feel, but rapid typing on the 102 produces a noticeable clatter. Unlike most other laptops, an internal 300 bps modem is a standard feature of the Model 102. Connection ports for a printer, bar-code reader, and serial devices are also provided. The Model 102's maximum memory of 32K of RAM may seem small in comparison to the 640K MS-DOS laptops, but the five programs built into the system squeeze a lot of utility into a small package. The ROM-based text editor, BASIC programming language, address book, appointment scheduler, and telecommunications programs are enough for many users. While on the go, files are normally stored in the 102's memory and may be moved to an optional external disk, to a cassette drive, or to another computer via the 102's modem or serial port. Four AA-size alkaline batteries provide power for up to 20 hours of operation, and an internal nicad battery preserves the contents of memory for up to 30 days. An AC adapter ($5.95) is also available. The Model 102 is completely compatible with its popular forebear, the Tandy Model 100. An extremely wide selection of hardware accessories and public domain and commercial programs are available. Although it is not MS-DOS compatible, the 102 is an affordable, lightweight system capable of doing a yeoman's service. Good third party support and convenient service through local Radio Shack stores continues to make the Tandy 102 (and Model 100) a familiar sight in press boxes and college classrooms. The Datavue Spark is an intelligently designed IBM PC-compatible laptop. One of the most desirable aspects of the Spark is that the variety of system configurations offered by Datavue effectively lets you "roll your own" laptop. The Spark's numeric processing power is a little over twice as fast as the original IBM PC. A $995 stripped down Spark comes equipped with one 3½-inch microfloppy disk drive and 384K of memory. When fitted with an optional rechargeable battery, a one-drive system weighs a shade over ten pounds and will run for over three hours on a charge. The standard supertwist LCD display is very good, with unusually high contrast. At extra cost, you can get an excellent backlit LCD screen second only to the much admired screen of Zenith's latest laptops. All Sparks come equipped with parallel and serial ports as well as ports for an external RGB or composite monitor, and an optional external 5¼-inch disk drive. System memory may be expanded to a full 640K by opting for a 256K expansion card. Room is also provided for a second disk drive and an internal 300/1200 bps modem. The 77-key keyboard features an embedded numeric keypad and ten function keys spread across the top. The Spark's keyboard feels good, but it's set a little too far back from the front edge of the system. The Spark has a number of convenient features not found on other machines. Built-in ROM-based utilities let you toggle the microprocessor speed, set the backlit display to shut off after a specified time, and do a wide variety of other things. But unlike most other laptops, there are no spring-loaded dust flaps shielding the disk drive slots when they're empty. Although the built-in handle is convenient, it feels less than secure. And while the Spark's overall construction is sturdy enough, its appearance and fit are not up to the standards of competing systems. These flaws, however, are easy to overlook when weighed against the Spark's overall versatility, cost, and ease of use. By letting you graft a wide variety of options onto a solid base system, Datavue helps you find a laptop that fits both your needs and your pocketbook. than a desktop computer. The problem lies not in how to turn it on, of course, but in how to decide where, and when, it's appropriate to use your laptop. Here are ten places, for instance, when popping the top of your laptop may not be the best idea. 1. At the dinner table. It's hard enough to get the entire family together these days, much less with someone clicking away behind a pile of mash potatoes and meatloaf. Eating and computers don't mix very well anyway. Crumbs, gravy, soup, and wine aren't appreciated by most keyboards and circuits. 2. In church. Tapping toes in rhythm to the current psalm may be trendy, but it doesn't mean keyboard clacking can substitute. Look at it this way: Be thankful there are a few places where you can't take your computer-and your workwith you. 3. On the airplane next to someone who's never seen a laptop. You won't get any work done, honest. Before you see the A> appear, you'll be answering questions like "What's that?" or "Are you sure that won't make the plane crash?" Corollaries include never using a laptop during in-flight movies (you'll lose your eyesight trying to see the screen in the dim light) and never using a laptop next to an in-flight drunk (you don't want a spilled drink-or worse-in your keyboard, do you?). 4. While you drive. Pay no attention to those people who dial cellular phones from their moving automobile. Dialing a phone is child's play compared to typing on your laptop. Whatever information you're entering or retrieving, let it wait. Ignore this rule when you're stuck in gridlock or driving across Wyoming. 5. At the movies, unless it's a drive-in or it stars Robbie Benson. Enough said. 6. Actually on the beach. Someone may have told you to buy a laptop so you could write that great novel while on vacation, but they didn't mean to take it down to the water's edge. Sand has a habit of getting in places other than your teeth and bathing suit. And just because the computer's chips are made of sand doesn't mean they yearn for their birthplace. 7. In the tub. Electricity loves water. Really. Makes it go fast and hot. The only time you should take a bath with your laptop is when you pay for it. 8. At a Macintosh user group's meeting. For the present, there are no economical Macintosh laptops. Mac owners, some who think their machine is the best thing since sliced silicon, don't like to be reminded. This rule gets repealed as soon as a Macintosh laptop costs less than $2,500. 9. In a classroom (to play something like Starflight). Your instructor will know you're not simply taking notes when, after blowing that alien spaceship to smithereens, you jump up and shout "Yee-hahh!" 10. On the subway late at night. There's a better way to do what you're doing. Just put a big sign on your forehead that says, "Yuppie Victim Here." Weighing in at a mere 6.2 pounds and able to leap into any standard briefcase with ease, the Toshiba 1000 is the undisputed featherweight champ of MS-DOS laptops. It's also relatively inexpensive ($1,199), but it lacks some of the muscle of more expensive heavy hitters. The 1000's non-backlit supertwist LCD screen has adequate contrast, but it's extremely difficult to read under less-than-optimal light ing conditions. With 24 lines stuffed into a three-inch tall screen, the display can sometimes look crowded. Processing power is exactly the same as a standard IBM PC, which places the 1000 at the low end of the MS-DOS compatible laptop spectrum. The rechargeable battery provides almost three hours of operation between charges. The 82-key keyboard has an extremely low profile but is surprisingly comfortable and well-suited for touch typists. The 1000 comes equipped with 512K of RAM and a single 3½-inch disk drive. Connectors on the computer's rear panel allow the 1000 to operate an external RGB monitor, parallel printer, and various serial devices. There's no provision for a second internal drive. That limitation is mitigated by MS-DOS being built into the system's ROM and the availability of an expansion card that lets you use the 1000 as a diskless computer. The optional ($549) memory expansion card provides an additional 768K of LIM (Lotus/Intel/Microsoft standard) expanded memory. Of the 768K, 128K may be used to fill out the 1000's main memory to 640K, and the balance may be dedicated as a nonvolatile ramdisk. An optional 300/1200 bps internal modem is also available. The Toshiba 1000 floats like a butterfly and stings like a standard IBM PC. It's a wonderful example of clever engineering, and it's the machine of choice for those who demand maximum portability in a PC-compatible laptop and who can live with the inconveniences dictated by that design. Portability. For the frequent traveler, less is generally more. As long as the machine meets your needs, the lighter the better. By the end of the day, a couple of pounds can make the difference between being tired and feeling fresh. Machines that will fit in a briefcase allow you to keep one hand free for hailing cabs and beating off Moonies in airports. Display quality and aspect ratio. The clarity of a laptop's display has a direct relationship to how long you can comfortably use it. If you can't easily see what's on your system's screen, you're likely to develop a mild case of eyestrain or a splitting headache. Backlit LCD or gas plasma displays are easiest on the eyes and are readable under almost any conditions. The best non-backlit LCD displays use special high contrast supertwist technology that works well under medium- to high-light levels but will still leave most users squinting under low light. The ratio of height to width of most laptop displays is lower than that of the displays used with desktop systems. The shorter the screen, the more compressed graphic images will appear. Battery/power characteristics. The amount of useful operating time between charges may limit the usefulness of a laptop. You can spend half of a coast-to-coast flight twiddling your thumbs if your machine is relatively power hungry or the battery is not fully charged. While they're being used, disk drives and internal modems put an extra load on batteries. Some units' batteries are easily removed, allowing you to carry several fully-charged packs. Compatibility. If you already own a desktop system, being able to run the same programs on both your laptop and desktop computers can be a definite plus. Most of today's laptops are IBM PC-compatible, but data such as text files can be easily moved between dissimilar systems via modem or serial port. Storage. One or two 3½-inch microfloppy disk drives will generally be adequate for most laptop users. An internal hard disk drive offers great convenience but typically makes a lap machine heavier and substantially more expensive. While the Equity LT is a relative latecomer to the PC-compatible laptop market, the Epson name has long been associated with laptop computers. The firm's prior experience has been put to good use, resulting in a fast, flexible, and feature-laden 12½-pound system. The LT comes equipped with a full 640K of memory and two 3½-inch disk drives. 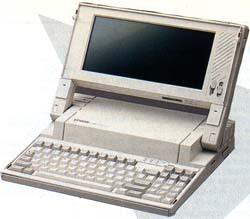 With nearly 2½ times the computational power of a standard IBM PC, the Equity is one of the fastest battery-powered laptops available. The Equity has two internal proprietary expansion slots, although the only announced accessory is a 300/1200 bps modem. External serial, parallel, 5¼-inch drive, and RGB monitor ports are standard. An optional 20-megabyte hard drive may be substituted for the second floppy drive. The standard non-backlit LCD display is yellow, rather than the more commonplace purple/blue. While the display takes some getting used to, Epson claims that the yellow screen is actually easier on the eyes. An LT with the standard display can operate up to seven hours between battery recharges. An extra-cost blue backlit LCD display is also available. The Equity LT's keyboard is an accountant's dream. The large keyboard includes a separate numeric keypad to the right of the Enter key and ten function keys across the top. Owners of desktop PCs will appreciate the inclusion of Traveling Software's excellent LapLink file transfer program with all Equity LT machines. The Equity LT is a solid laptop offering from a firm with a reputation for reliable and well-designed products. Although the LT is a bit on the heavy side, its high performance, comfortable keyboard, and expandability make it an attractive choice for the first-time laptop purchaser. The NEC Multispeed is a fast, versatile, PC compatible laptop with a number of interesting twists. The Multispeed was the first laptop machine to use a true 16-bit microprocessor. It's more than twice as fast as a standard IBM PC. 640K of memory is standard, and up to 126K of main memory may be set up as a nonvolatile ramdisk. Five ROM-based applications are standard, including a text editor with spelling checker, an outliner, a simple database, a telephone dialer, and a terminal program. The system's 512K of ROM also contains extensive online help screens that may be called up at the press of a button. 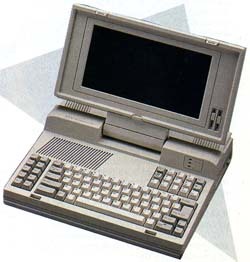 The Multispeed was one of the first laptops to use supertwist LCD technology. The standard display has good contrast but is difficult to read under low light conditions. An optional backlit screen is also available. The 85-key keyboard has a solid touch and has the ten function keys on the right hand side, an arrangement users of older PC key boards will appreciate. A full-size numeric keypad is included, but it's located above the main key group to conserve space. Two 3½-inch microfloppy drives are included, as well as serial, parallel, and RGB color monitor ports. Internal modems-both 300/1200 and 300/1200/2400 bps models-are available. The standard Multispeed weighs 11.2 pounds and operates for about three and a half hours between charges. The NEC Multispeed is a solid machine, with an intelligent design and a healthy dose of speed. 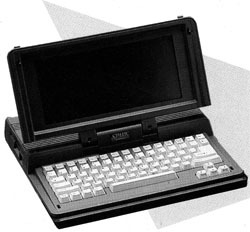 When introduced in early 1987, it set new standards for battery-operated laptops and continues to hold its own today. Carrying cases. A carrying case is an essential accessory unless your laptop is small enough to fit in a briefcase or you move it about infrequently. While a shopping bag might do, a case designed for your laptop offers better protection from the elements and often has compartments for AC power supplies, disks, and other odds and ends. Most cases offered by manufacturers won't keep a laptop from being damaged if dropped on a hard surface from a height of more than a couple of feet. If you're rough on your equipment, consider using a hard or soft case intended for protecting photographic equipment instead. Halliburton Zero, Pelikan, and LowePro make top-notch cases that will accommodate most popular laptops. Look for these cases in most photography stores. Portable printers. Getting it down on paper lets you share your work with others and lets you conveniently reference material without having to boot up your machine. Portable printers used to be AC-only affairs that were often as heavy as to computers to which they were attached. Kodak's Diconix 150 is the most notable of recent offerings. The Diconix ($499 list) is a nicad batterypowered, ink-jet unit about the size and weight of an average hardcover novel. Modems. Internal modems offered by laptop manufacturers may be convenient, but they're relatively expensive and use valuable battery power while in use. Inexpensive external modems no larger than a deck of playing cards are less expensive and are easy to pack along. If you're a portable telecomputer on a budget, check out the Novation Parrot 1200, Migent PocketModem, and WorldPort 1200 and 2400. File Transfer Programs. You can move files between machines (typically between a laptop and a desktop, or vice versa) by using terminal software with file transfer capabilities, but doing so can be a slow, tedious process. Specialized file transfer programs such as White Crane's Brooklyn Bridge and Traveling Software's Lap-Link for IBM PC compatible systems simplify the process of moving multiple files and do so at speeds 12 times faster than the fastest speed of most terminal software. Spares. If you rely heavily on your laptop, double up on items that may put you out of service, even though your machine is perfectly functional. A spare AC power supply is insurance against losing the original. An extra rechargeable battery can extend your untethered operating time. 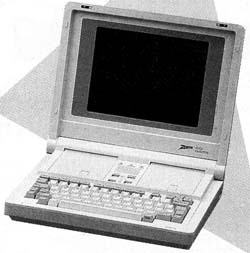 If you think you've never seen a lap computer with a display you can live with, odds are you've never seen a Zenith Z-180 series laptop. Add a hard disk to the equation, and you have a compact machine that makes few compromises. The Z-183's standard backlit display is visually stunning. Dark blue characters clearly stand against a shocking blue background from almost any viewing angle. Screen brightness and contrast are adjustable across a wide range. The 6 X 8 inch display area yields an image with no trace of aspect distortion. Characters are not crunched vertically, and plotted circles are truly circular. The Z-183 has 640K of memory. A full megabyte of expanded memory may be added with an optional add-in card. Processing speed of the Z-183 is adequate, clocking in at about 1.4 times faster than a standard IBM PC. One 3½-inch microfloppy drive and a 10-megabyte hard drive are standard. A 20-megabyte drive is also available. When equipped with the standard rechargeable battery, the system will operate for a little over three hours with heavy use of the hard drive. An optional high-power battery raises extended operation to five hours or more between charges. The 78-key keyboard has an embedded numeric keypad and 10 function keys. The feel of the keyboard is good, but some touch typists may find the key spacing a hair too tight. The Z-183 comes with parallel and serial ports and outputs for an external RGB or composite monitor. An internal 300/1200 bps modem is optional, and floating-point arithmetic fans will find an internal socket that accepts an Intel 8087 math coprocessor. The Z-183 has a sturdy, integrated carrying handle, but it's rather heavy for a laptop, weighing over 15 pounds. This almost classifies the machine as "luggable" rather than portable. Arnold Schwarzenegger may be able to toss the Z-183 around like a toothpick all day, but most users will start wishing for a bionic arm after 15 minutes. The number-crunching power of the Z-183 may fall short of other laptops, too, but the excellence of its display and the convenience of an internal hard drive will tip the scale for many prospective purchasers. If you don't need a hard drive, consider the Zenith 181, a lighter, dual-microfloppy version of the Z-183. 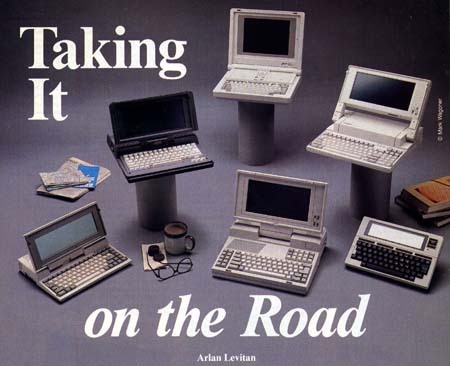 Arlan Levitan, Contributing Editor and author of the monthly column "Levitations," is also the hardware analyst for Consumer Guides' Computer Buyer's Guides.